The Department of Biochemistry offers a wide variety of academic, leadership and needs-based awards to recognize outstanding student achievement and provide support for our Biochemistry Specialist and Major students. 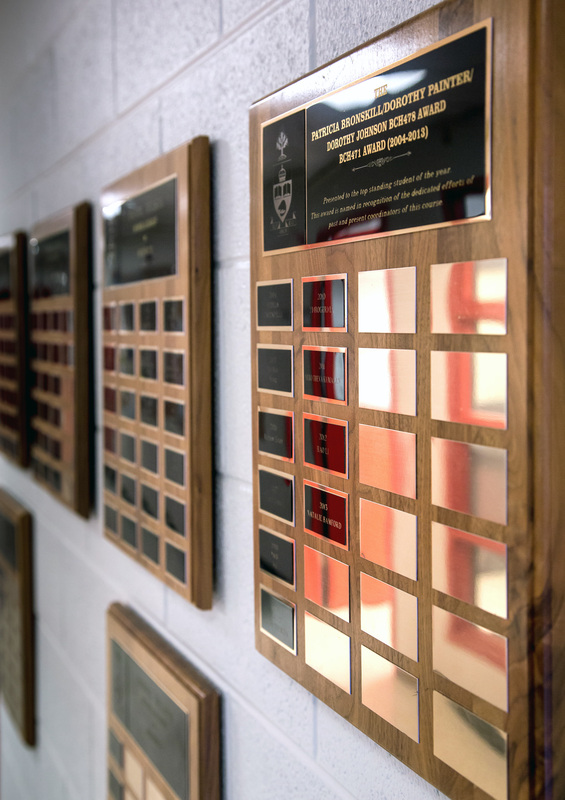 In conjunction with the Division of Teaching Laboratories (DTL), an award is given each year to recognize the outstanding achievement of one student in BCH370H. More information regarding the Lois Dove award can be found on the DTL website. The Faculty of Arts and Science recognizes outstanding BCH students and honours them through the Amy Britton Award, the Daniel Wilson Scholarship and the Ross S. Lang Scholarship in Life Sciences. The Faculty of Medicine also recognizes undergraduate students for their leadership, scholarship and outstanding contributions to student/academic life. For more information on the Graduate and Life Sciences Education (GLSE) Undergraduate Leadership Awards please click here. BCH210H: In honour of Dr. R. Roy Baker, this annual award is presented to an outstanding BCH Major student with the highest final grade in BCH210H. The Department recognizes the of the many years of service that Dr. Roy Baker provided, the excellence of his teaching particularly in BCH210H, and the leading role he played in the creation of the Biochemistry Major program. BCH377H: In honour of Jacqueline Giles and Edith Anderson, this annual award is present to an outstanding Specialist student with the highest final grade in BCH377H. BCH478H: In honour of Patricia Bronskill, Dorothy Johnson and Dorothy Painter, this annual award is presented to an outstanding BCH Specialist student with the highest final grade in BCH478H. The department has available the following awards for students applying to the summer student research program. There is no specific application form. Awards will be given to successful applicants.